Is this ‘posing considerable risk of injury’ for passers-by? BANKSY’S stencilled maid, a familiar sight on the back wall of the Roundhouse, might just be the loneliest woman in Chalk Farm – it seems whatever company she keeps is swiftly removed by higher powers. 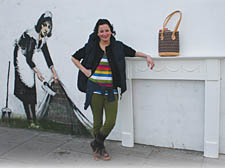 The graffiti artist’s celebrated cleaner has long raised hopes that the wall in Regent’s Park Road might become a hot-bed of local creativ­ity, but when a mysterious wooden mantelpiece was screwed into place by a mystery carpenter on Monday night it met the same sticky fate as all its predecessors – removal. At just six inches wide, the mantelpiece was hardly a major art installation but council officials insisted it had to be removed on – you guessed it – health and safety grounds and within 24 hours it was gone. Luckily the New Journal snapped a picture early on Tuesday morning before it was destroyed. The decision has annoyed critics who believe it’s a case of one law for Banksy – whose stencil is touched up and repaired – and another for lesser-known street artists, whose work is removed apparently with hardly any consideration of its creative merits. Conservative environment chief Councillor Mike Greene, a self-confessed Banksy fan, has spoken of his desire to have designated areas for people to “go wild with a paintbrush” and express their artistic side. He was unavailable for comment all day but his group leader Councillor Andrew Marshall admitted apparent double standards for Banksy works were “a difficult issue”. Banksy’s work has sold for as much as £1 million. While other graffiti on the Chalk Farm wall is swiftly whitewashed, the precious maid has received regular paint touch-ups to guard against wear and tear. Prior to its removal, the mantelpiece had attracted its fair share of artistic plaudits.